TN Smokies Closed: Shutting down much of the federal government this past week meant national parks across the country were closed. The third most visited park in the country last year according to the National Parks Conservation Association is the Great Smoky Mountains. Brandon Hollingsworth and Christine Jessel from WUOT in Knoxville, Tn., went to the Smokies to get reaction from visitors hoping for a fun fall experience only to find the park closed. Hear from Drema and Fred Johnson from West Virginia, Alyss and Rachel Miller from Ohio, Florence Gibson from Missouri, Don and Rebecca from Alabama and their granddaughter, Abigail, from Kentucky and Zack Newman who lives in Maryville, Tn. and works at a restaurant just outside the Park entrance in Townsend. KY WV Parks Open: State parks across Appalachia want to make sure visitors know there’s an alternative to visiting the national parks. West Virginia’s state parks and forests have been publicizing the fact that they’re open and have lodging available. All of Kentucky's 49 state parks remain open. WV Inspiring West Virginian: As we continue our series of Inspiring West Virginians, here's the story of a man originally from Berkeley County who's working hard to preserve the state's unique and wild places. Producer Jean Snedegar takes us to the top of a mountain with field biologist Rodney Bartgis, the State Director of The West Virginia Nature Conservancy. Birders look for migrating raptors at Hanging Rock in Monroe County, W.Va.
WV Raptor Migration: This month, hawks, falcons, and eagles will continue their migration south, and thousands will pass through the eastern mountains of West Virginia. This year, on Sunday, Sept 22nd, one thousand 591 raptors were counted at the Hanging Rock Raptor Observatory in Monroe County, W.Va. This broke the record for the most raptors logged at Hanging Rock in a single day since 1995. 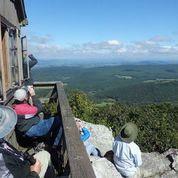 To see the migrating raptors pass just feet from view, hundreds of visitors come each Fall to the Hanging Rock Lookout Tower, originally a fire tower for the Forest Service, located in the George Washington and Jefferson National Forests, in the southeastern corner of West Virginia. recently Roxy Todd and Dan Schultz caught up with some of the volunteer naturalists who travel daily to help record the migration of raptors up at Hanging Rock. WV Story Teller CD: Story telling is an old art form in Appalachia. One West Virginia story teller’s newest project, a CD of music and stories entitled The Mountain Came Alive, attempts to modernize this tradition by addressing today’s concerns. KY School Music Program: Instruction which includes instruments is known to enhance a child’s appreciation of music. But, musical instruments are not always within the reach of families with modest means. A program launched by the Central Kentucky Youth Orchestra provides the tools needed by low-income music students. WEKU’S Stu Johnson has more from Lexington.